Electricity completely changed the manufacturing setup, telecommunication etc. Refrigeration is an excellent example for this. When the electricity comes in power, drastic changes occurs in different platforms like healthcare, agriculture, technical and so on. Now Artificial Intelligence (AI) is in that position and is transforming several industries in major sectors massively. To name a few- Web search, advertising etc. are powered by AI. Let discuss one example of how AI Impact our day to day life as Electricity does? AI help us with the logistics. AI route the driver to your door. It helps us to estimate the food delivery at your doorstep with live tracking. Thus, we can clearly state that AI helps site and get relaxed like electricity while the food you ordered is delivered at your doorstep. AI not only empowering the essential services, also it’s having its mark in IT industry too. So what is AI( Artificial Intelligence)? Artificial intelligence is defined as behaviour of a machine, which performs the task/operation given without human interaction quickly and effectively. The machine is well-equipped to perform the process more quickly with less manpower. Narrow Intelligence: Focused on a small or straightforward task. Strong Artificial Intelligence:A machine generally as intelligent as a human being. It can drive your car as well make a pancake for you in the morning. Super Strong Artificial Intelligence:The machine that is improving itself including redesigning the hardware and software and ready to provide solutions to the given problem that you have never brought to the machine. Identify the success factor in screen job applicants to highlight the people who are most predisposed to perform well. Artificial intelligence has been growing Exponentially in the past decade. It has already been touching our lives and ways that you might not notice.For example, Every time you go on google search, some AI is being used to show a specific result to your query. Every time you ask a question, Natural language processing (NLP) and speech recognition is used to provide you the accurate result. Artificial Intelligence will probably be one of the most significant scientific breakthroughs. In the 21st century, It will give us the power to prop the universe and our humanity with a different approach. AI has the potential of forever changing our humanity. The backbone of Artificial intelligence is machine learning. We want to make the machine learn and make a decision on its own. Use Algorithms to find meaning in random and unordered data. Use the learning algorithm to find the relationship between our knowledge and improve their learning process. So the overall goal for Machine learning is quite simple, to improve the machine performance on a specific task. I am going to share one of my recent experiences where AI helped me to a great extent: Past year me and my family travel around the world, we are unaware of some places and their distances. At that instance, the tools called Google Maps helped us in finding the best route. Another tool called Google translate helped us to communicate with the people in that region. This all happened only through Artificial intelligence. Thus, I conclude that we can gain a great understanding of how most AI works. The translator is getting faster and more accurate. So the learning process for Google translate is inspired by humans. Thus, doing things better by practising. 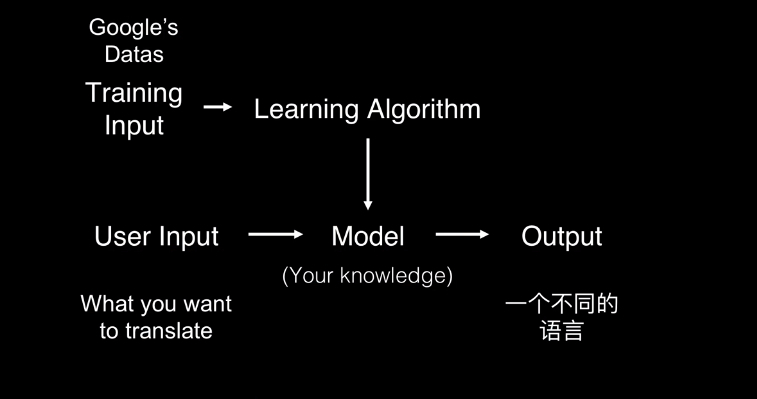 We have to use some training input and put that into a learning algorithm, which will give some input in the form that can is understand by a machine. This helps that machine gain knowledge on an individual subject. After this, when the user provided the machine with an input, hopefully the machine delivers some output. 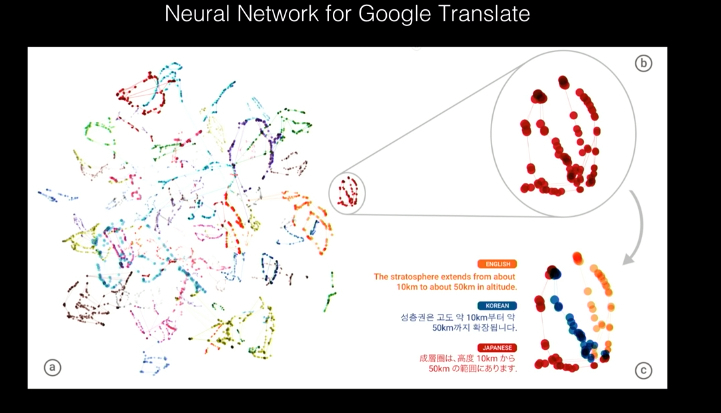 If you use Google search, we rank differently in machine learning. If you are using Maps while driving, Streets View automatically recognizes petrol pump sign, food courts signs,hospital signs etc. using machine learning. Google Duo with video calling uses machine learning for low data transmission situation. Take a look at this picture,here is the sample of an email. 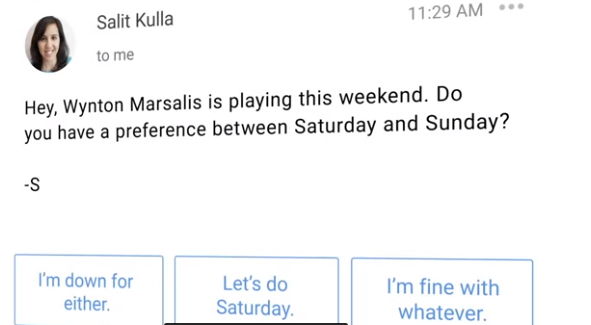 We are rolling out Smart reply to over 1 billion of users of Gmail.It’s work really well.If you get an Email like this, the machine learning system learn to be conversational and it can reply “I am fine with saturday” or “whatever”. So,I believe this is the beauty of the technology and it is essential to understand that AI is nothing more than just a tool. Just something to help us do different things better. Something to augment our capability but not a whole different scary thing. Artificial Intelligence is new power and almost unavoidable, and we better get used to it because this is one trend that isn’t going away anytime soon. It’s expected to grow 300% in this year over last. AI is poised to have a profound impact on our lives, and it’s everywhere.